This is a collection of magazine and newspaper articles, written stories, and oral histories about the creation of Lake Norman, the effects of the lake on the community, and the places covered by the lake’s waters. The Land Beneath the Lake by Alison Baker. LKN Lot Sale and Porter Wagner Announcement poster. Campbell, Donna. 2013, August. “The Inland Sea.” Our State. Helms, Lori. 2013, Aug. 15. “Just Call it Port Knox.” Lake Norman Citizen. Jacobs, Cindy. 2013, June 18. “Bold Plan Took Shape in 1957.” Mooresville Tribune. Known Cemeteries and Burial Records of Mecklenburg County, NC. 2008. “Baker Graveyard.” Public Library of Charlotte & Mecklenburg County. Available: http://www.cmstory.org/cemetery/details.asp?id=21. “The Lake that changed the Landscape.” 2004, March. Lake Norman Magazine. Long Island, NC Facebook page. 2011-Present. Accessed: 12/10/2012. Available: https://www.facebook.com/t091939r?fref=ts. McShane, Chuck. 2013, August. “Lake Effect.” Charlotte Magazine. National Register of Historic Places Inventory – Nomination Form. 1974. “Powell-Trollinger Lime Kilns.” Available: http://www.hpo.ncdcr.gov/nr/CT0004.pdf. North Carolina Office of Archives & History. nd. “Battle of Cowan’s Ford Essay.” Available: http://www.ncmarkers.com/print_marker.aspx?id=L-22. North Carolina Office of Archives & History. nd. “Early History.” Available: http://www.ncmarkers.com/print_marker.aspx?id=MM-1. North Carolina Office of Archives & History. nd. “William Lee Davidson.” Available: http://www.ncmarkers.com/print_marker.aspx?id=L-23. North Carolina’s Governors. “William Alexander Graham.” Available: http://www.northcarolinahistory.org/encyclopedia/553/entry. “Secrets of the Lake.” 2004, Nov. Lake Norman Magazine. 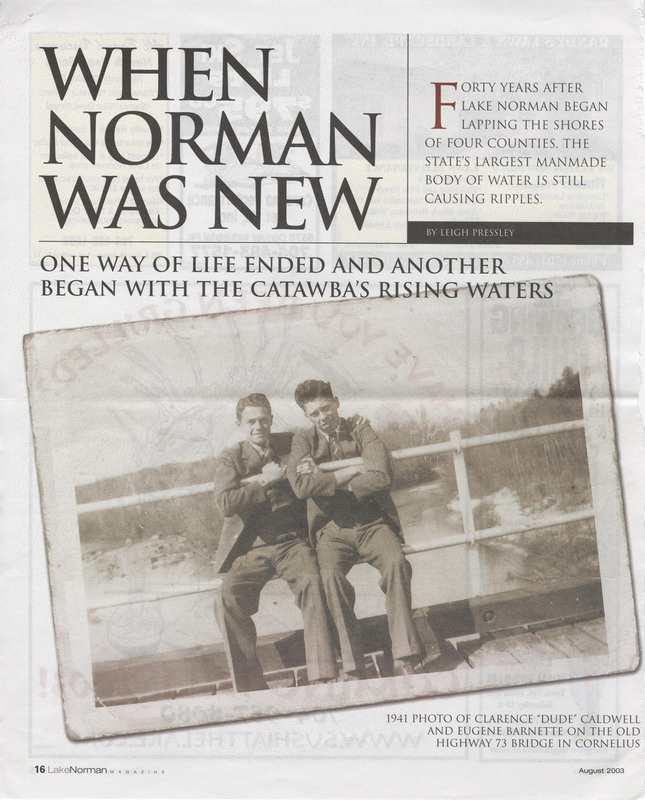 “When Norman Was New.” 2003, August. Lake Norman Magazine. Sources from contributors when provided and additional sources for entries researched by Davidson Archives’ staff. Buffalo Shoals Structure In Use Since Late 1918. 1961, Sept 16. “Buffalo Shoals Structure In Use Since Late 1918.” Statesville Record and Landmark, page 2. Connor, R. D. W., Boyd, William Kenneth, de Roulhac Hamilton, Joseph Gre´goire. 1919. History of North Carolina. Lewis Pub. Co., New York. Davidson, Chalmers G. – Plantation Files, Elm Wood Plantation (John D. Graham, Lincoln County, NC). Davidson College Archives, file number DC058. Davidson, Chalmers G. 1951. Piedmont Partisan: The Life and Times of Brigadier-General William Lee Davidson. Davidson College, Davidson, N.C.
Davidson, Chalmers G. nd. “A guide to Historic Sites and Building”, summarized from The Plantation World Around Davidson. General William Lee Davidson Collection. Davidson College Archives, file number DC060. Henderson, Bruce. 2013, Sept. 29. “Lake Norman at 50, public and private.” The Charlotte Observer. Howe, Claudia. 1959, Oct 11. “Doomed by Progress-Village Faces Watery Grave”. The Charlotte Observer. Hunter, C. L. 1877 (1930 ed.). Sketches of Western North Carolina, Historical and Biographical. Edwards & Broughton Company, Raleigh, NC. Jacobs, Cindy. 2008. Around Lake Norman. Arcadia Publishing. Josey, Jerry. 1959, Mar 31. “Closing Dates Settled For Two River Plants.” Statesville Record and Landmark, page 1. Josey, Jerry. 1959, Sept 25. “Mill at Long Island Will Close.” Statesville Record and Landmark, page 3. Long Island Village & Cotton Mill Monument. 1965. Erected by Monogram Grange #1078. Marusak, Joe. 2103, June 14. “Lake Norman Began with a Band and a Prayer.” Charlotte Observer. Marusak, Joe, and Hilary Trenda. 2013, June 14. “Residents recall impact, early years of Lake Norman.” Charlotte Observer. New Bridge Opened. 1962, Oct 22. “New Bridge Opened.” Statesville Record and Landmark, page 2. Personal Interviews with Mr. Jim Williams and Mrs. Pat Carpenter. Conducted on 12/4/2012 by Davidson College Staff. Plant To Close At East Monbo. 1960, Dec 20. “Plant To Close At East Monbo.” Statesville Record and Landmark, page 1. Ramsey, Robert W. 1964. Carolina Cradle: Settlement of the Northwest Carolina Frontier, 1747-1762. Seeman Printery, Durham, NC. Sherrill, Elizabeth Bray. 1989. The Long Island Cotton Mill/Superior Yarn Mill. Publisher: Sherrills Ford, NC : E.B. Sherrill. Stenhouse, J.A. 1952. “A map of historic Mecklenburg and lands which were once a part thereof” [cartographic material]. Originally published as part of: Exploring old Mecklenburg, James Alan Stenhouse, 1552. Stonestreet, O.C. 2013, Aug. 4. “Thoughts on 50-year-old Lake Norman.” Statesville Record & Landmark. Trenda, Hilary. 2013, June 14. “Lake Mostly Covered Rural Areas.” Charlotte Observer. Williams, Robert L. “East Monbo: The First Field of Dreams” in People Worth Meeting and Stories Worth Repeating. Dallas, NC: Southeastern Publishing, 2000. pp108-112.